Beston Group is the leading scrap tyre recycling plant manufacturer and supplier in China, and we have more than 10 years’experience in the field of waste tires recycling pyrolysis. 1. Put the whole waste tyre into pyrolysis reactor , then heat the reactor with coal/ wood/natural gas/oil. when the temperature reach around 250 degree celsius oil gas will produce. 2. Liquid oil will be cooled out by cooling system from oil gas, which is collected by oil tank. 3. 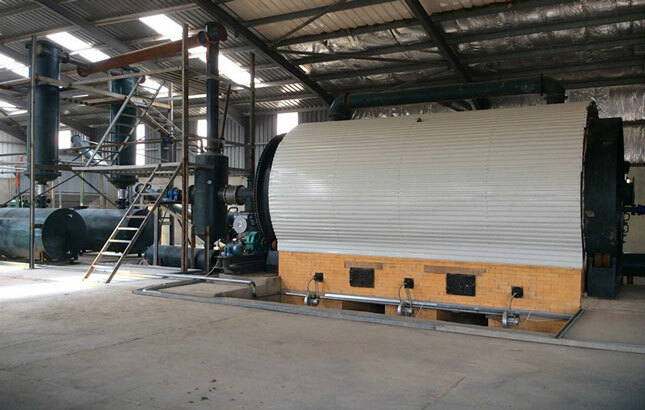 The waste gas can not be cooled out in normal pressure, which will be recycled to heat reactor. This not only save energy, but also protect the environment. 4. The dark smoke produced by heating reactor can achieve national emission standard through dual desulfurization and dusting removal device. 5. The temperature of reactor will be low after we get oil, at this moment carbon black will be discharged automatically. 6. When the temperature falls to 100 degree celsius, worker could put steel wire hook to reactor to take steel wire out, then another batch will be begin. 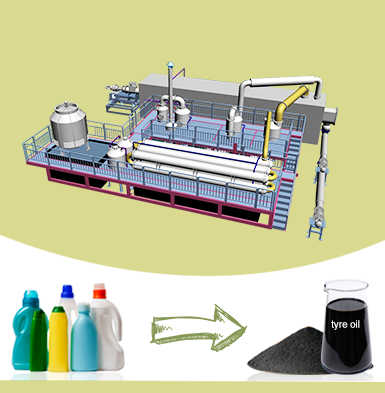 The Pyrolysis oil from tires pyrolysis can be widely used as fuel oil in industries such as steel and iron plant, boiler factory, ceramics and power or chemical industries etc. And it can be also used for generators to generate electricity; Or further refined into diesel by using the waste oil distillation equipment. 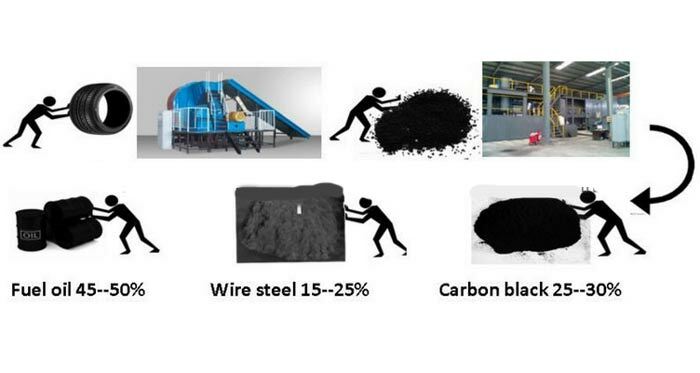 The carbon black can be used for construction bricks with clay, also can be used as fuel; Or can be ground for industrial carbon black through a carbon black processing machine. The steel wire can be recycled into smelting plant. (1) It has mature production design and advanced installation and operating technologies. (2) It is equipped with automatic tire shredding machine, automatic feeding and slag system and steel wire separating system. (3) Totally sealed to ensure no gas or peculiar leaks out. (4) Horizontal rotating design that ensures the heating efficiency and energy saving. (5) Convenient to feed material. (6) Efficient tubular condenser system. (7) Latest united heat insulation to extend serving life of the reactor. 1. Machinery installation and worker training , till you can run the factory smoothly. 2. 12 months guarantee period. 3. Regular phone call visiting and technology updating. 4. Free catalyst offering for one month’s running. 5. Free wear parts offering for one month’s running.